This week we’re chatting with Mike Arnesen, founder of UpBuild, a technical marketing agency in Portland. A past guest of the show, Mike is back to discuss website engagement and Google Analytics with us. Today’s episode came to be after Dylan read an UpBuild blog post on improving your bounce rate and wanted to bring Mike back on the show to discuss. Mike explains what a bounce rate is, how it’s calculated and why a higher bounce rate isn’t necessarily a bad thing. He discusses using code to gather more data points and calculate more accurate bounce rates in Google Analytics. Mike shares on the importance of checking exit pages in Google Analytics and of performing a quality assurance audit on your site after any major site update. Lastly, we learn about the importance of using call-to-action buttons to navigate a visitor through the website and convert them from visitor to floater or visitor to subscriber. Amy has been hitting some barriers this week so she’s decided to shift gears and focus more on the finishing details for their center. She’s been working on picking out the aroma scents for the aromatech system, the playlist and paint colors. Amy also has a great book recommendation for dealing with customer complaints, Hug Your Haters. She plans to use the book to improve training with their staff. At the Float Shoppe, Dylan embraced his inner sweaty-palmed-middle-schooler-about-to-ask-a-girl-on-a-date and focused on meeting nearby neighbors to build partnerships and add value to their packages. He’s hoping to use an idea from Amy to partner with a distillery for a Father’s Day package. 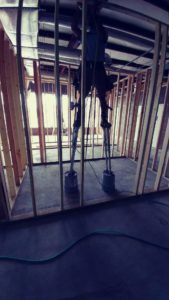 Amy’s Contractor walking on bucket-stilts!